The Canadian Museum of History (French: Musée canadien de l’histoire) is Canada's national museum of human history. It is located in the Hull area of Gatineau, Quebec, directly across the Ottawa River from Parliament Hill in Ottawa, Ontario. The museum's primary purpose is to collect, study, preserve, and present material objects that illuminate the human history of Canada and the cultural diversity of its people. 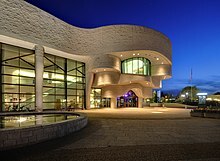 Formerly the Canadian Museum of Civilization (French: Musée canadien des civilisations), the name of the museum was changed in 2013 to the Canadian Museum of History. The Museum of History's permanent galleries explore Canada's 20,000 years of human history and a program of special exhibitions expands on Canadian themes and explore other cultures and civilizations, past and present. The museum is also a major research institution. Its staff includes leading experts in Canadian history, archaeology, ethnology, and folk culture. The museum also organizing traveling exhibits. With roots stretching back to 1856, the museum is one of North America's oldest cultural institutions. It is also home to the Canadian Children's Museum. It used to be the home of the Canadian Postal Museum. The Museum of History is managed by the Canadian Museum of History Corporation, a federal Crown Corporation that is also responsible for the Canadian War Museum, the Children's Museum and the Virtual Museum of New France. The museum is a member of the Canadian Museums Association. The museum is affiliated with: Canadian Museums Association (CMA), Canadian Heritage Information Network (CHIN), and Virtual Museum of Canada. The museum has three permanent exhibition galleries: the Grand Hall, the First Peoples Hall, and the Canadian History Hall. The museum also operates a movie theatre, a children's museum and special exhibit galleries. The Grand Hall on the building's first level is the museum's architectural centrepiece. It features a wall of windows 112 m (367 ft) wide by 15 m (49 ft) high, framing a view of the Ottawa River and Parliament Hill. On the opposite wall is a colour photograph of similar size. It captures a forest scene and is believed to be the largest colour photograph in the world. The picture provides a backdrop for a dozen towering totem poles and recreations of six Pacific Coast Aboriginal house facades connected by a boardwalk (which is often used as a stage for different events). The homes were made by First Nations artisans using large cedar timbers imported from the Pacific Northwest. The grouping of these totem poles, combined with others in the Grand Hall, is said to be the largest indoor display of totem poles in the world. The Grand Hall also houses the original plaster pattern for the Spirit of Haida Gwaii, by Haida artist Bill Reid, his largest and most complex sculpture. The pattern was used to cast the bronze sculpture displayed outside the Canadian Embassy in Washington, D.C. Located at the end of the Grand Hall, by the river, is a 19 m (62 ft) diameter dome. On the dome is the 418 m2 (4,500 sq ft) abstract painting known as Morning Star. The painting, by First Nation artist Alex Janvier a Dene Suline artist, and, with the assistance of his son Dean, was completed in four months in 1993. Also on the Museum's first level, this permanent exhibition narrates the history and accomplishments of Canada's Aboriginal peoples from their original habitation of North America to the present day. It explores the diversity of the First Peoples, their interactions with the land, and their on-going contributions to society. The Hall is the result of a groundbreaking, intensive collaboration that occurred between museum curators and First Peoples representatives during the planning stages. "An Aboriginal Presence" looks at Aboriginal cultural diversity, achievements and prehistoric settlement of North America. Included are traditional stories about creation and other phenomena told by Aboriginal people such as Mi'kmaq Hereditary Chief Stephen Augustine who recounts the beginning of the world in the Creation Stories Theatre film. "An Ancient Bond with the Land" examines the relationship between Aboriginal Peoples and the natural world. "Arrival of Strangers - The Last 500 Years" examines Aboriginal history from the time of European contact to today. It examines early relations, the Métis, the clash of Christianity and Aboriginal beliefs, intergovernmental relations, the introduction of a wage economy, and post-World War II political and legal affirmation and civil rights. It also features a ten-minute video about sustaining Aboriginal culture, and introduces visitors to Native art. The Canadian History Hall is a permanent gallery dedicated to Canadian history that encompasses both the third and fourth floors of the museum, formerly home to the Canada Hall and the Canadian Personalities Hall and meant to be more comprehensive, inclusive and engaging than its precursors. It opened on July 1, 2017, in celebration of the 150th anniversary of Confederation. The museum was designed by Douglas Cardinal, a famous Aboriginal architect educated at the University of British Columbia and the University of Texas at Austin. The museum complex consists of two wings, the public and curatorial wings, surrounded by a series of plazas connected by a grand staircase. Naturalized park areas connect the museum and its plazas to the Ottawa River and nearby Jacques Cartier Park. The cantelivered levels of the Curatorial Wing represent the outcropping bedrock of the Canadian Shield. The museum was founded in 1856 as the display hall for the Geological Survey of Canada, which was accumulating not only minerals, but biological specimens, and historical and ethnological artifacts. It was founded in Montreal, and was moved to Ottawa in 1881. In 1910, upon recommendation from Franz Boas, the anthropologist-linguist Edward Sapir was appointed as the first anthropologist in the newly formed anthropology division of the museum. Soon after, the anthropologists Diamond Jenness and Marius Barbeau were hired. In 1910, now named the National Museum of Canada, it moved into the brand-new Victoria Memorial Museum Building on Metcalfe Street in downtown Ottawa. The National Gallery of Canada also occupied half a floor in the building. In 1968, the museum was split into the Museum of Nature and the Museum of Man, but both remained in the same building. In 1982, the Government of Canada announced that the Museum of Man would be moved to its own separate facility in Hull, Quebec (now Gatineau). In response to criticisms that "Museum of Man" could be interpreted as gender-biased in light of modern sensibilities, a competition was launched in 1986 to find a new name. The National Museum of Man became the Canadian Museum of Civilization. In 1989, the museum moved into the new facility. At the time of its opening, the cost of the museum had ballooned from an initial estimate of approximately $80 million to approximately $340 million. Despite initial criticisms of the perceived Disneyfication of the museum, its enormous costs, unique architecture, and unfinished exhibits from many quarters (including the Conservative government of Brian Mulroney), the museum soon became a major tourist attraction and was embraced by different political factions as a national symbol of "a pluralistic, multicultural society." In 2005, the museum attracted 1,396,000 visitors but attendance had fallen to 1.2 million in 2010. The purpose of the Canadian Museum of Civilization is to increase, throughout Canada and internationally, interest in, knowledge and critical understanding of and appreciation and respect for human cultural achievements and human behavior by establishing, maintaining and developing for research and posterity a collection of objects of historical or cultural interest, with special but not exclusive reference to Canada, and by demonstrating those achievements and behaviour, the knowledge derived from them and the understanding they represent. The purpose of the Canadian Museum of History is to enhance Canadians’ knowledge, understanding and appreciation of events, experiences, people and objects that reflect and have shaped Canada’s history and identity, and also to enhance their awareness of world history and cultures. In 2016, the museum changed its theatre from an analog IMAX theatre with 3D capacity to a Barco digital theatre, known as CINE+. 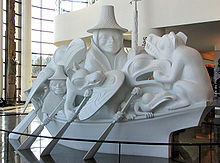 Wikimedia Commons has media related to Canadian Museum of History. Christy Vodden, Ian Dyck (2006). A world inside: a 150-year history of the Canadian Museum of Civilization. Canadian Museum of Civilization Corporation, Gatineau. ISBN 0-660-19558-5. ^ "Canadian Museum of Civilization" (in French). The Canadian Museum of Civilization. Retrieved 24 April 2011. ^ "The President and CEO". The Canadian Museum of Civilization. Retrieved 17 October 2012. ^ "Canada's most visited museum celebrates 150th anniversary" (Press release). The Canadian Museum of Civilization. 10 May 2006. Retrieved 7 June 2006. ^ a b c Butler, Don (12 December 2013). "Hello, Canadian Museum of History". Ottawa Citizen. Archived from the original on 13 December 2013. Retrieved 13 December 2013. ^ Pontbriand, Pierre. "Canadian Museum of History". The Canadian Encyclopedia. Retrieved 24 April 2011. ^ "Canadian Children's Museum" (in French). Civilization.ca. Retrieved 2011-04-24. ^ "The Canadian Postal Museum is now closed". Canadian Postal Museum. Government of Canada. Archived from the original on 2014-01-21. Retrieved 28 October 2013. ^ "Canadian Museum Association". Museums.ca. Retrieved 2011-04-24. ^ "Permanent Exhibitions" (in French). Civilization.ca. Retrieved 2011-04-24. ^ a b "Grand Hall" (in French). Civilization.ca. Retrieved 2011-04-24. ^ "First Peoples Hall" (in French). Civilization.ca. Retrieved 2011-04-24. ^ "Morning Star" (in French). Civilization.ca. Retrieved 2011-04-24. ^ "Exterior Features and Landscaping". Written in the Stone: An Architectural Tour of the Canadian Museum of Civilization. Canadian Museum of Civilization. Retrieved 26 July 2011. ^ "Canadian Museum of Civilization - Institutional History". Canadian Museum of Civilization Corporation. 29 December 2005. Archived from the original on 2006-10-06. Retrieved 2006-10-11. ^ Gillam, Robyn (2001). Hall of Mirrors: Museums and the Canadian Public. Banff, AB: The Banff Centre. ISBN 0-920159-85-0. ^ Gessell, Paul (October 12, 2011). "PROFILE: Talking plans with Canadian Museum of Civilization CEO Mark O'Neill". Ottawa Magazine. Retrieved 22 November 2012. ^ "Section 8, Museums Act (S.C. 1990, c. 3)". Justice Laws Website. Department of Justice. Retrieved 13 December 2013. ^ a b "Bill C7: An Act to amend the Museums Act in order to establish the Canadian Museum of History and to make consequential amendments to other Acts". LEGISinfo. Parliament of Canada. Archived from the original on 4 March 2016. Retrieved 13 December 2013. ^ "Full text of BILL C-7: An Act to amend the Museums Act in order to establish the Canadian Museum of History and to make consequential amendments to other Acts". Parliament of Canada. Retrieved 13 December 2013. ^ "IMAX Theatre with 3D capacity" (in French). Civilization.ca. Retrieved 2011-04-24. ^ Cox, Aidan (February 29, 2016). "History Museum theatre upgrades into the future". Ottawa Citizen. Retrieved March 18, 2019. This page was last edited on 18 March 2019, at 13:43 (UTC).